Our Red Dragon is complete with 5 deluxe cabins and 2 decks, which resonate with superior class and grandeur. 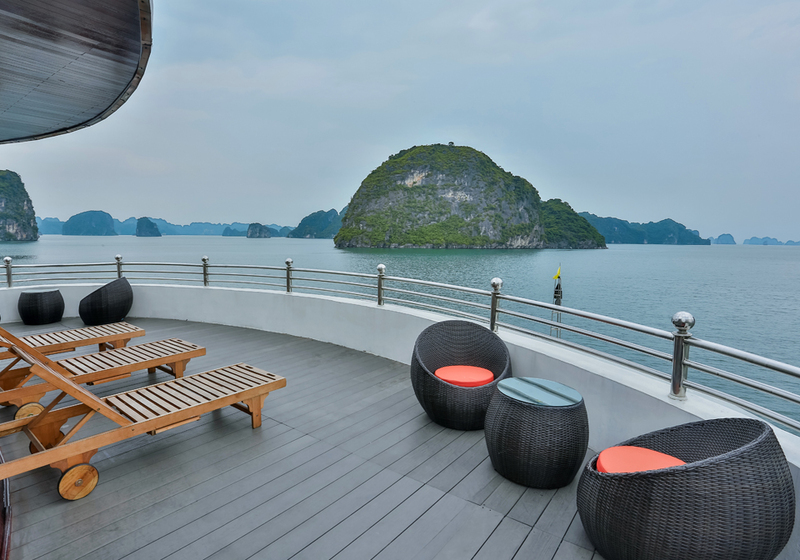 Although it is larger than the Prince and L’Amour Junks, it is still small enough for an intimate view of the natural wonders, pocket lagoons and small fishing communities of Bai Tu Long Bay, cruising off the beaten track. The charming Red Dragon Junk is an excellent companion to explore the natural beauty while enjoying the warm welcome from our well-trained staff. Your 2-day 1-night cruise trip starts with picking you up at your hotel in Hanoi Old Quarter roughly from 7:30 am to 8:00 am. 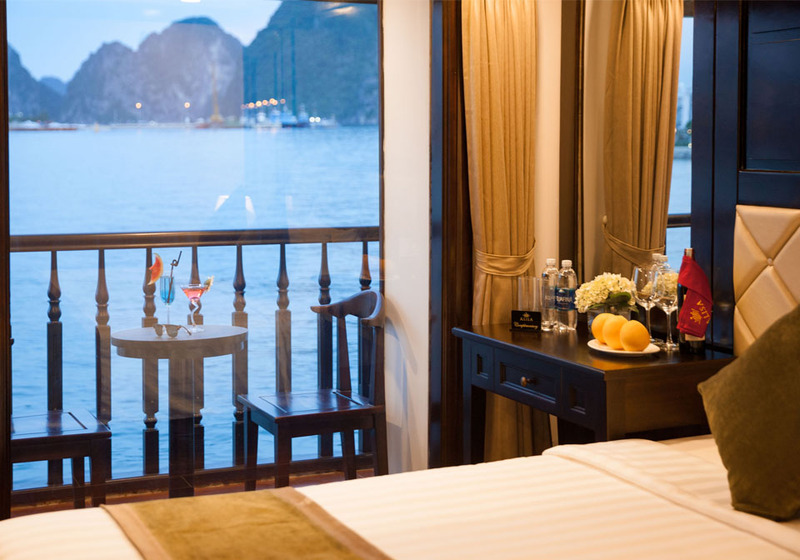 After 4 hours driving, it is time for check-in to one of the finest cruises in Ha Long Bay. 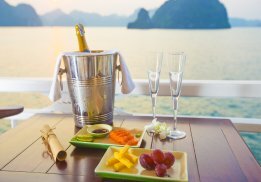 The cruise manager and staff will welcome you with drinks and a brief agenda for your trip, and then you will enjoy a lovely lunch with the cruise take you further toward Bai Tu Long Bay. After the lunch, you will visit Thien Canh Son cave, go kayaking or relax on a beach. The dinner will be served at around 7:00 pm and after the dinner is your chilling time. The second day of your trip starts early with a tea or coffee. At 7:00 AM, breakfast will be served onboard. After the breakfast, you will continue cruising around the bay then visit a fishing village or explore a cave and other activities (depending on your cruise). After that, you will get back to the boat, check out your cabin at 10:00 AM and have a delicious lunch. Back to Hanoi. Trip ends and we drop you back at your hotel in Hanoi Old Quarter. Our drivers will pick you up at your hotel in Hanoi Old Quarter from 7:30 am to 8:00 am. At 12:00 pm, you will check in to your room after receiving a warm welcome and a briefing by cruise staff. In the afternoon, you will discover the beauty of Bai Tu Long Bay by kayaking, it is time for relaxing on the beach or swimming in the lukewarm water. The time for dinner starts at around 7:00 pm then it is your free time. The squid fishing is available upon request. After having the breakfast in the slow pace on the second day of your trip, you will be guided to a further area for kayaking and discover the magical beauty of the bay, visit Thien Canh Son cave and relax on the beach. You will spend most of your time outdoors, and the BBQ lunch will be served on a private beach. In the afternoon, you will be back to the boat, enjoy cruising and have a dinner onboard. 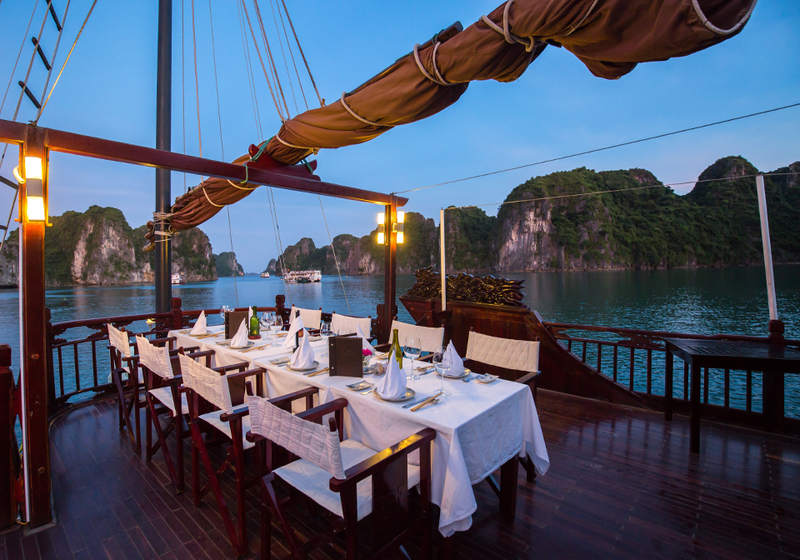 After the breakfast, you will get visit Vung Vieng fishing village or relax on board and enjoy the magnificent seascape of Ha Long Bay. The last meal on board serves at 10:45 AM, before having lunch, you should pack your luggage and get ready for checking out at 10:00 AM. Separate bathroom cabin with glass-standing-shower. Within minutes a quiet beach is transformed into a romantic spot with beautiful umbrellas providing shade and an elegant dining table right on the beach. Our crew will invite you for a BBQ lunch on the beach – as if it were a wonderful gift granted by a mermaid. Imagine for a moment that you are the only people on earth enjoying a fabulous meal under the clear blue sky on your own private beach. This BBQ on the beach is offered and included in 3 day 2 night cruise.